Sire and Dam are both Purebred Saanen and the animal meets Sable breed standard. Sire and Dam are both Purebred Sable and the animal meets Sable breed standard. In addition, the purebred herd book will be open, just as the LaMancha purebred herd book is. This means that when an individual animal’s Sable ancestors have been in the American herd book for three generations, or if one parent has 3 generations of American Sable and the other is Purebred Sable, its offspring will be eligible for registry in the Purebred Sable herd book if that offspring also meets Sable breed standard. Sables registered with AGS will automatically be accepted for registration by ADGA in the Purebred Sable registry upon application and in compliance with the rules for registering an AGS registered animal with ADGA. Sire and Dam are both American Saanen and the animal meets Sable breed standard. Sire and Dam are a combination of American and Purebred Saanen and the animal meets Sable breed standard. 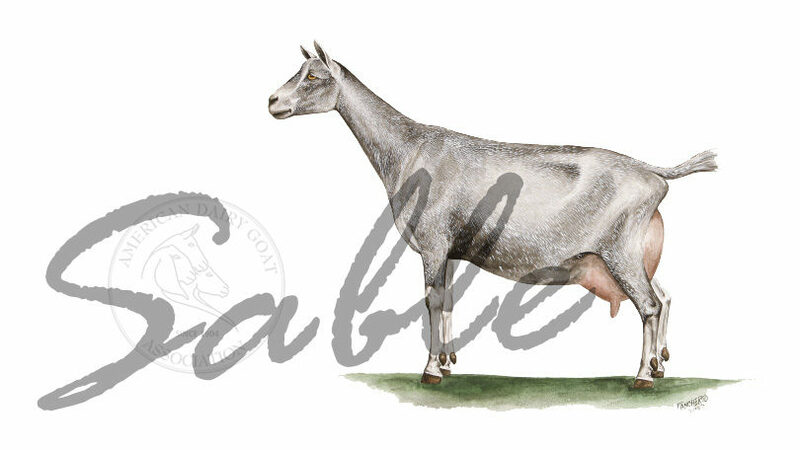 Females only can be registered as American Sables when the sire is an American or Purebred Sable and the dam is 75% or higher Saanen/Sable genetics in the Grade, Grade Experimental or Experimental registries. The doe to be registered, as well as her dam and her maternal granddam must meet correct Sable breed standards including color. Animals of at least 50% Saanen/Sable genetics & with any color other than white or light cream, may be entered into the Grade Sable herd book on application by their owners. The Grade Sable herd book will parallel the existing grade herd books. What happens if a white offspring is born to a Sable dam? This individual will be eligible for the Experimental herd book, as it does not meet the Sable breed standard. Then it is the option of the owner to decide to breed it to a Sable buck to breed towards the American Sable herd book, a Saanen buck to breed toward the American Saanen herd book, or another breed for upgrading into another American program by the rules of the Experimental registry. Can I keep my animals in the Experimental herd book if I want to? The ADGA Board of Directors voted to extract all animals that qualify as Sables into their appropriate Sable herd books as a separate breed designation. The Experimental herd book has been ADGA’s “big tent”, allowing some flexibility for breeders to work within the recognized standard dairy goat genetic pool towards a breed herd book and is where animals that DON’T meet the requirements of one of the regular breed herd books are kept and bred from until offspring do meet the standard, generations and percentages required to qualify for one of the breed herd books, at which time those offspring automatically enter an American herd book of a breed. The Experimental herd book has requirements just as the standard breed herd books do. Specifically, that the animal does NOT meet the requirements to be in a standard breed herd book by the rules of the Experimental program. If offspring of two Saanens meet all other breed standards of Saanens other than color, they DO meet the Sable breed standard and that is the only place they would be qualified to go. They would NOT qualify for the Experimental herd book.